I remember Ward Kimball stating in an interview how ridiculous he thought some the Disney film titles of the 1940s sounded to him. 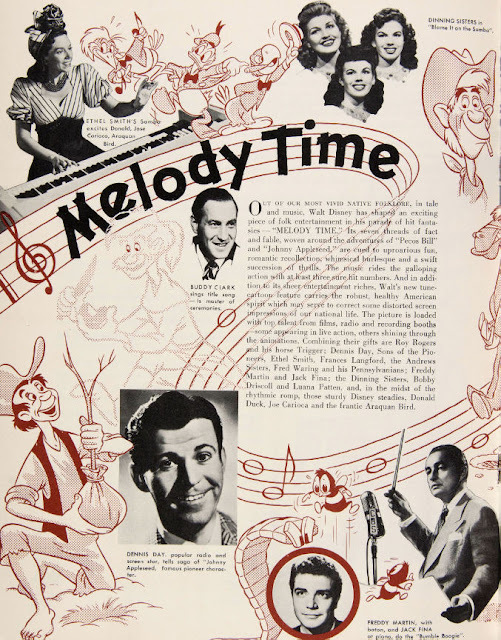 "Fun and Fancy Free, Make Mine Music, Melody Time...what kind of titles are those?" 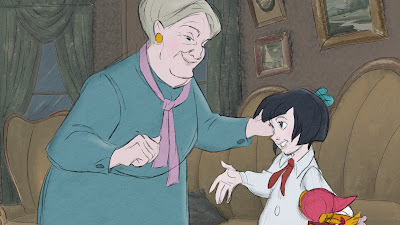 Be that as it may, the short films within these features contain some beautiful character as well as effects animation. 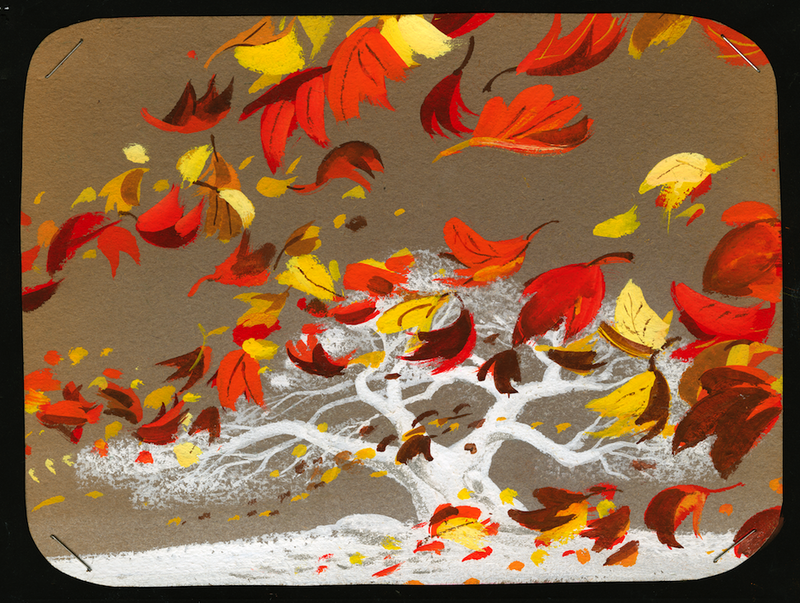 And there is also a sense of experimenting with a variety of unique styles. 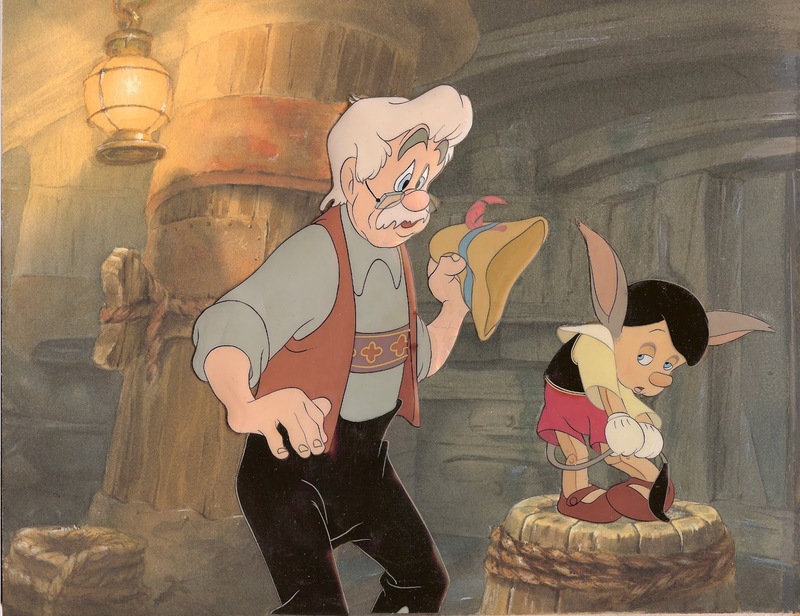 It ain't Pinocchio, but these movies are still very enjoyable to watch and to study. 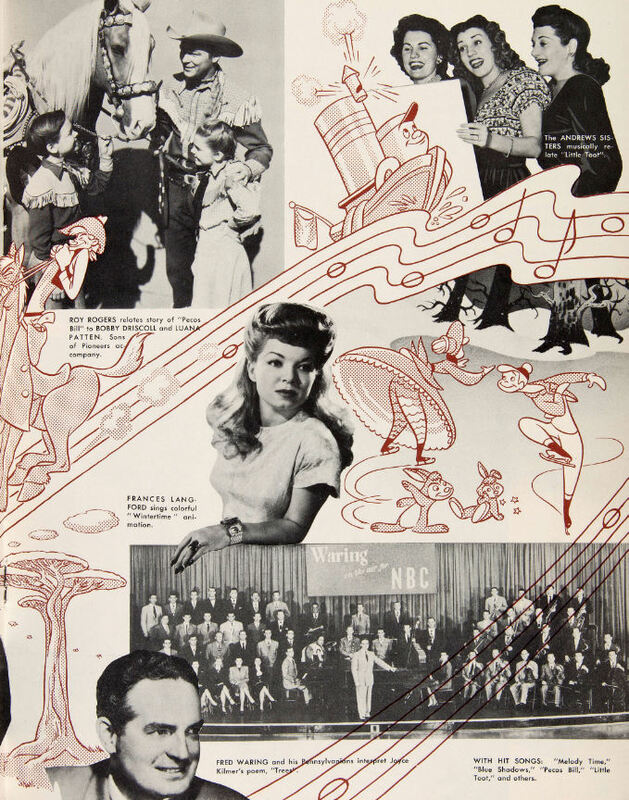 Above a 1948 magazine article, followed by artwork from each of the film's segments. 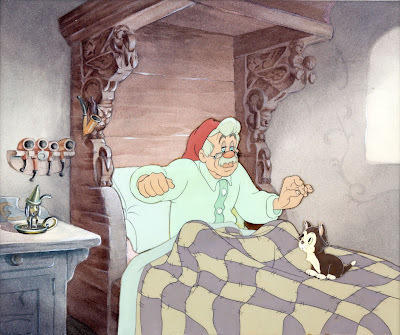 We are in the process of colorizing this scene, early on in the film. Sarah just received a gift from her Grandma, a Russian folklore doll. 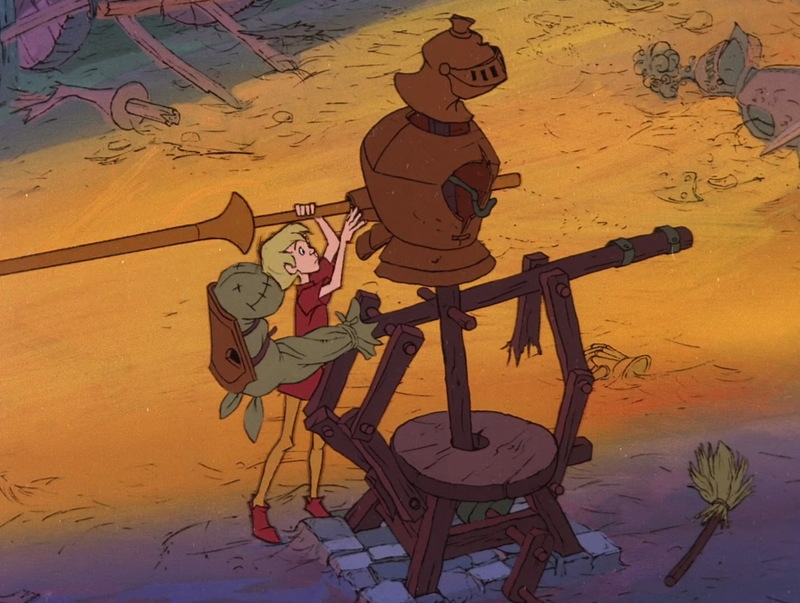 This all takes place in Kiev in 1975. 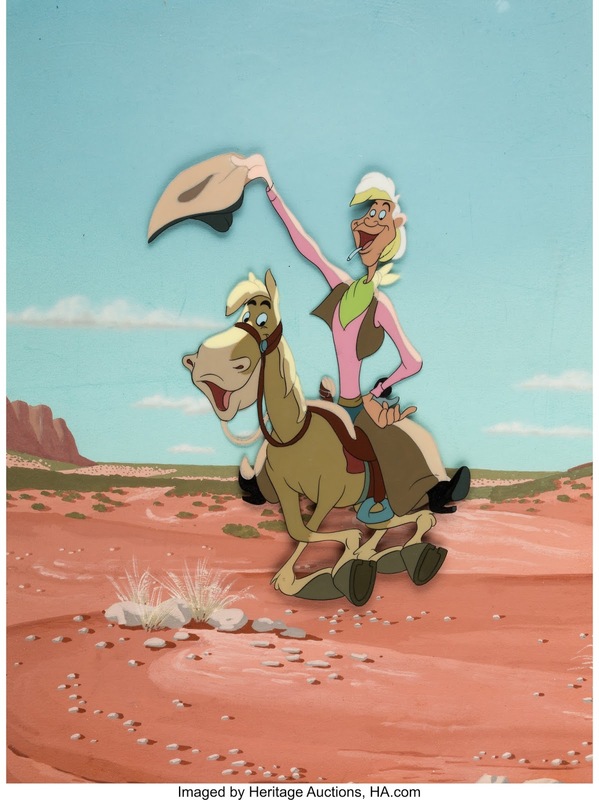 The feedback from screening the film to select audiences in progress has been wonderful. Kathryn Beaumont told me how much she loves the film's story. 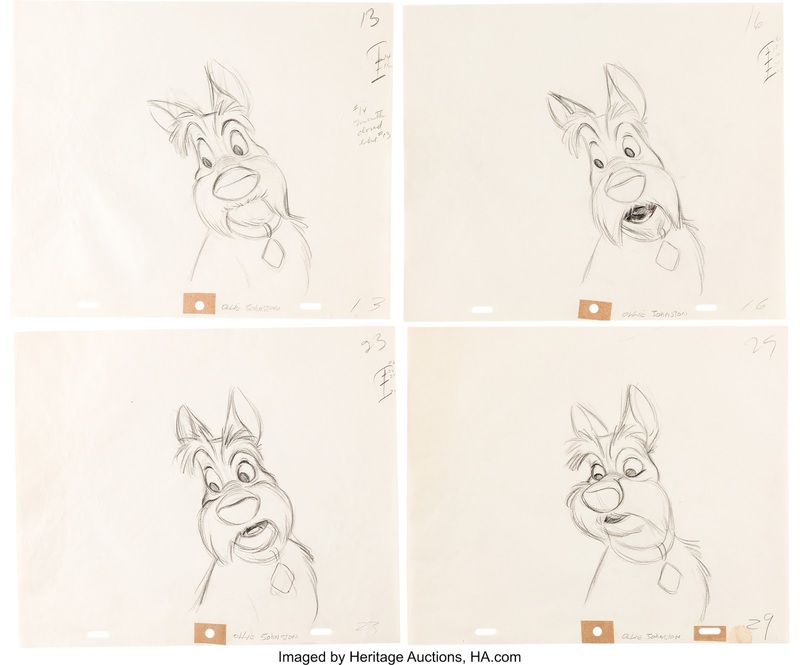 Lisa Davis (Anita from 101 Dalmatians) voiced similar comments. 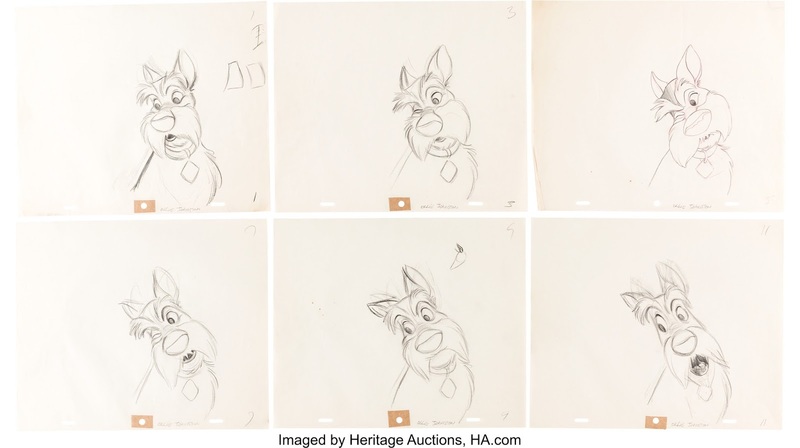 Woolie talks about the animators' challenges when working on the characters for Disney's 1967 animated film The Jungle Book. (Walt's last animated project and my favorite Disney movie). This interview was filmed during the early 1980s at the LA Zoo. Woolie just gets one thing wrong about Mowgli trying to get back to the man village, which he really doesn't want to do. 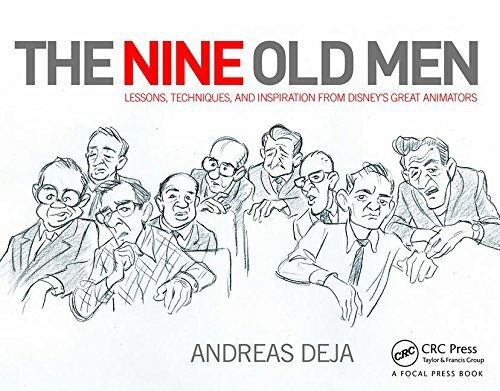 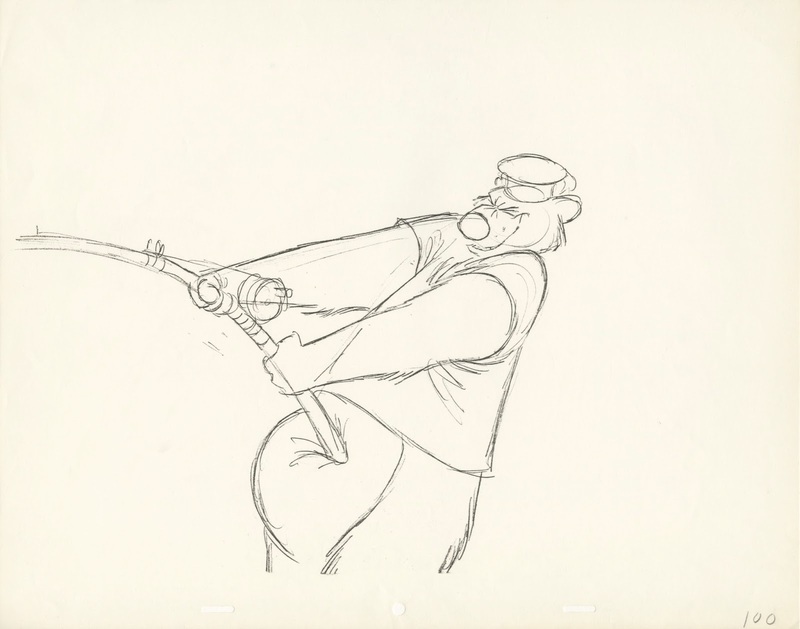 Nevertheless, historical statements from an iconic master of Disney Animation. 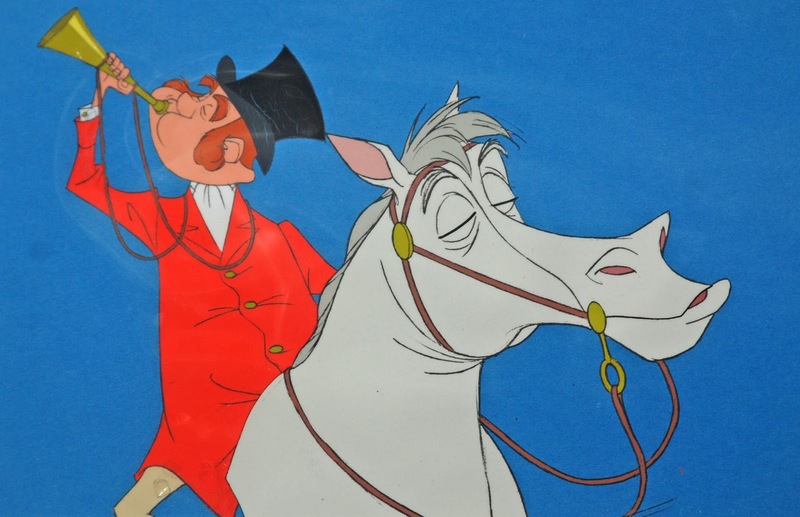 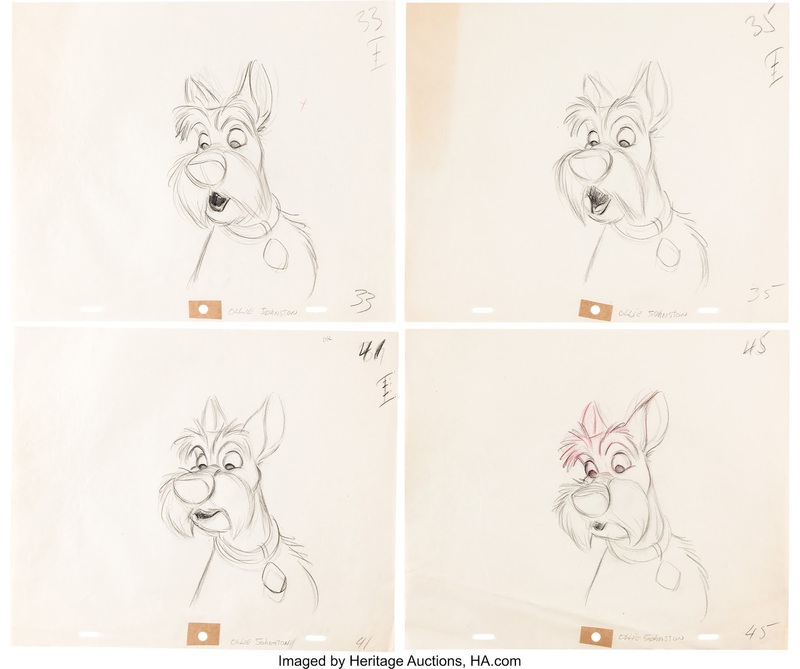 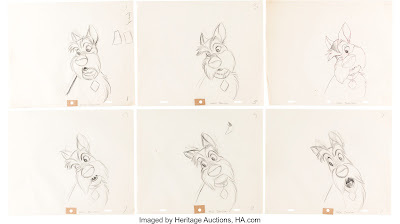 Beautiful sensitive animation drawings by Ollie Johnston of Jock from Lady and the Tramp are currently offered by Heritage Auctions. Ollie's approach is uncomplicated, with only one thing in mind: the character's inner emotions. 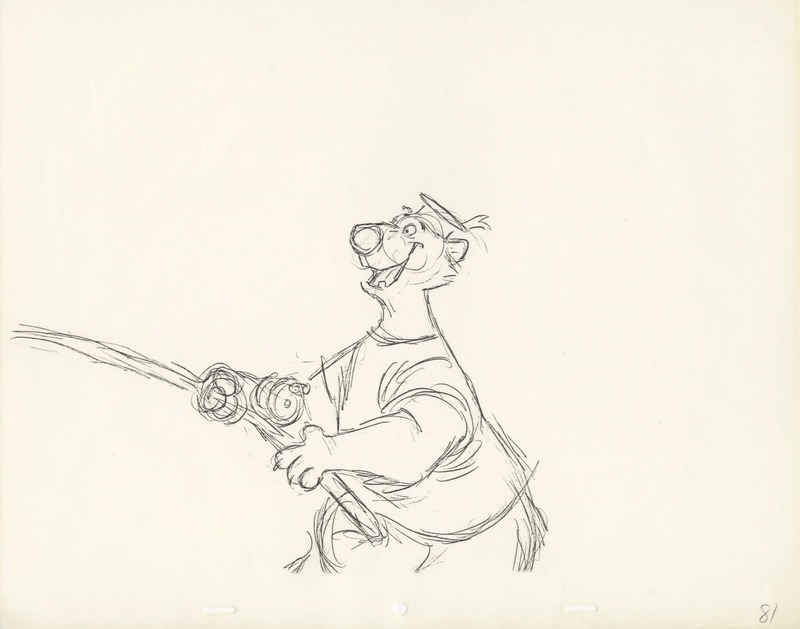 As I mentioned before, his light touch with the pencil allowed Ollie to get through his scenes quickly. 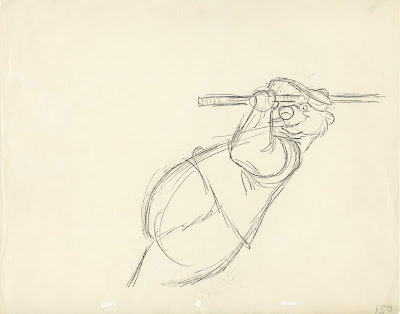 He often provided more footage than most animators did on any given production. 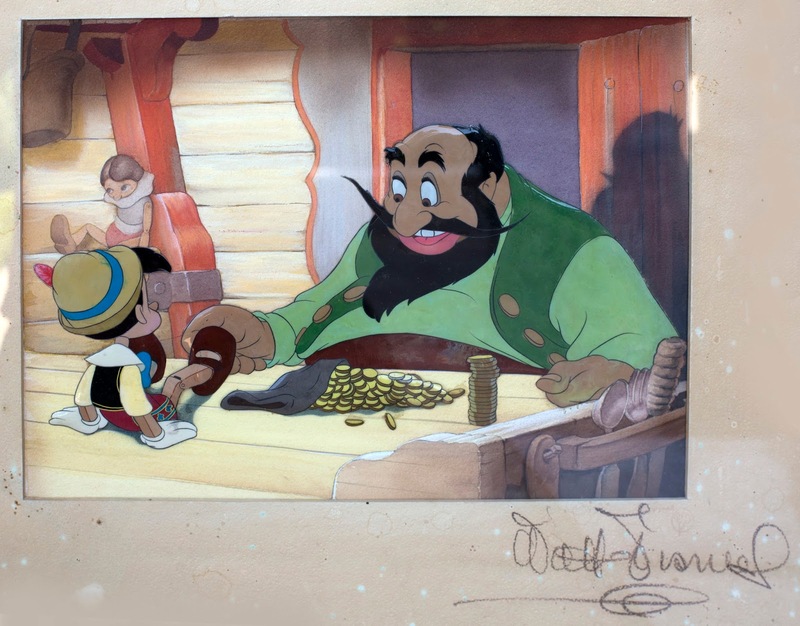 A few cel set-ups from Pinocchio, one of the most beautiful films of all time. 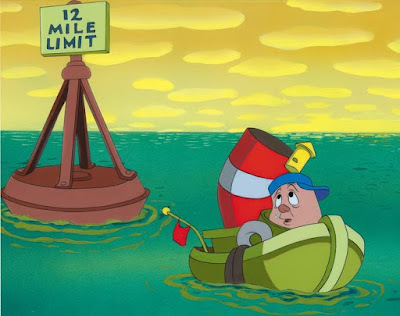 And yet, according to Frank Thomas, even this masterpiece suffers from at least one grave story problem. But about that some other time. I will be at CTN this weekend and I look forward to meeting and talking to some of you. 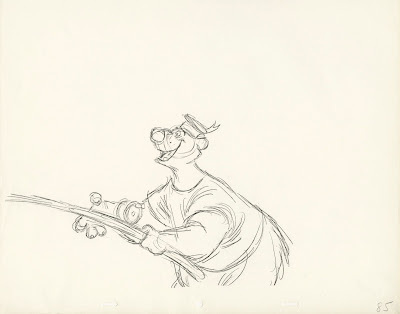 I love the animated sequences in Mary Poppins and Bedknobs and Broomsticks. 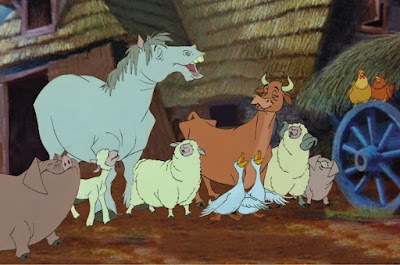 Wether anthropomorphic or standard animal types, the designs as well as the animation are just beautiful. Just look at this trio of underwater creatures. 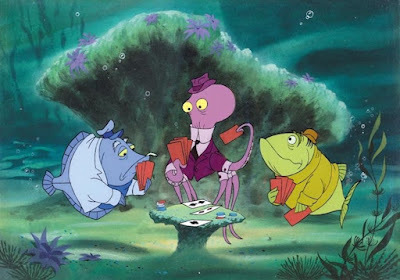 How would you fit clothes convincingly on to fish?! Below a vis/dev sketch of the bed with five humans entering the Blue Lagoon. 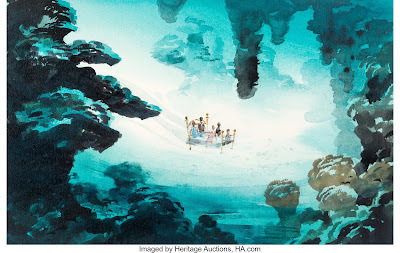 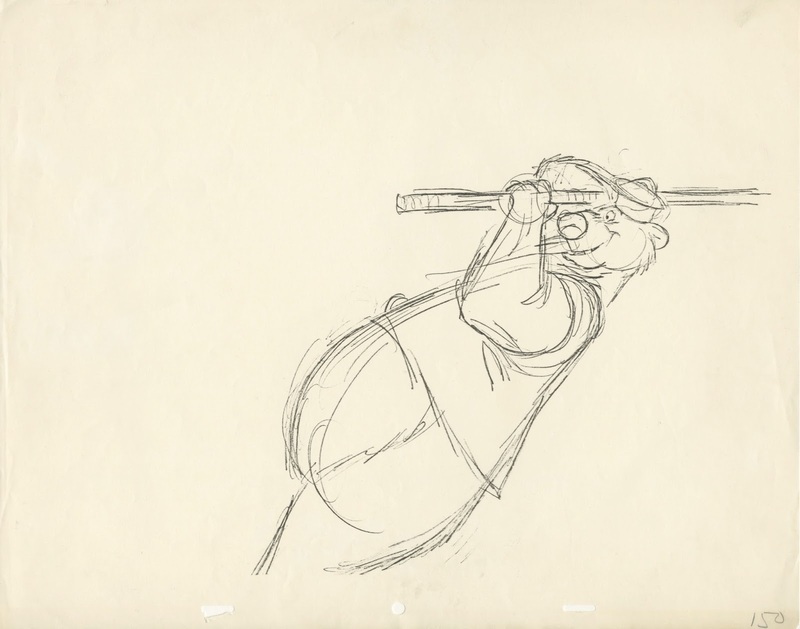 You just can't go wrong with Milt Kahl designs animated by John Lounsbery. All of these farm animals are so beautifully brought to life. Combined with a Sherman song, it's animation heaven. 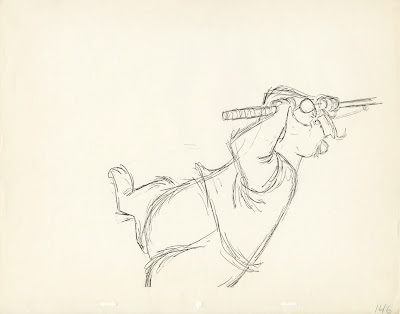 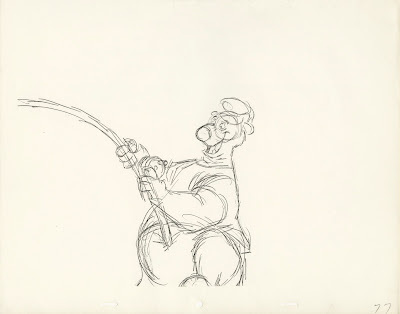 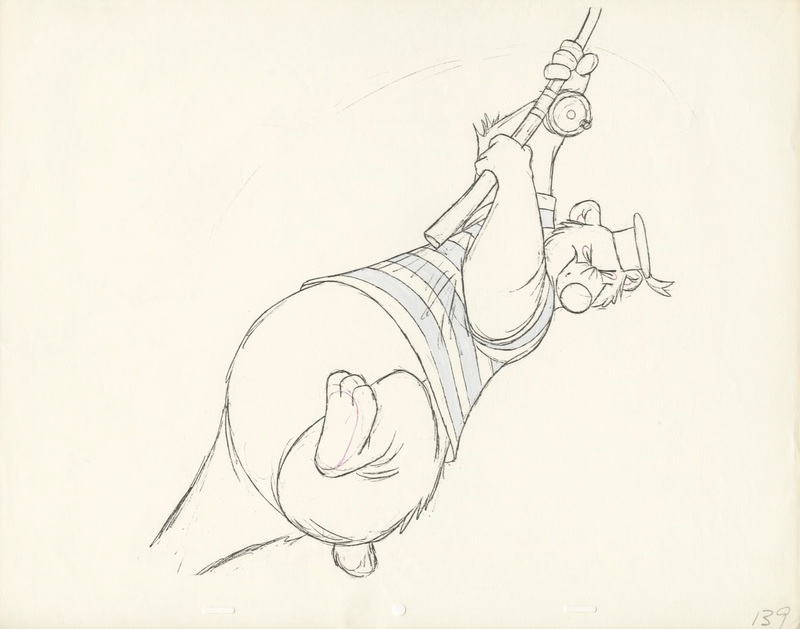 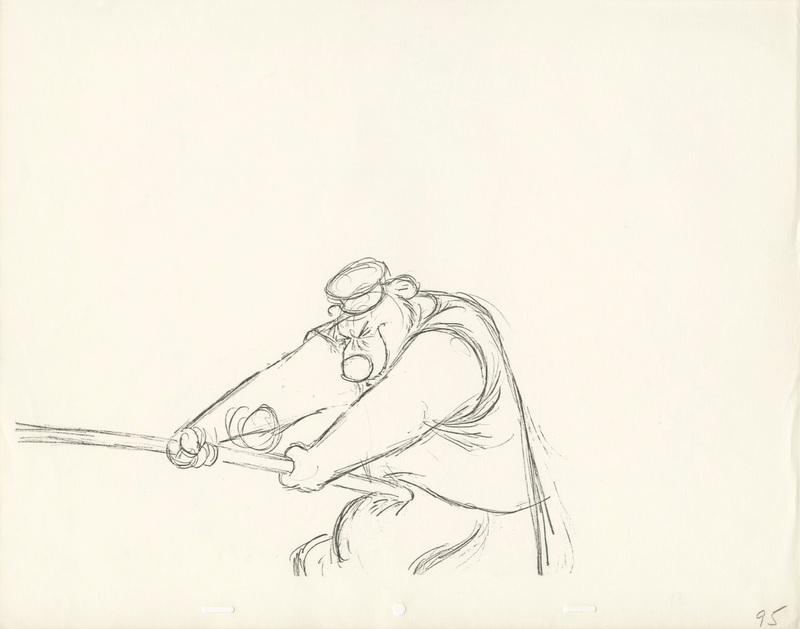 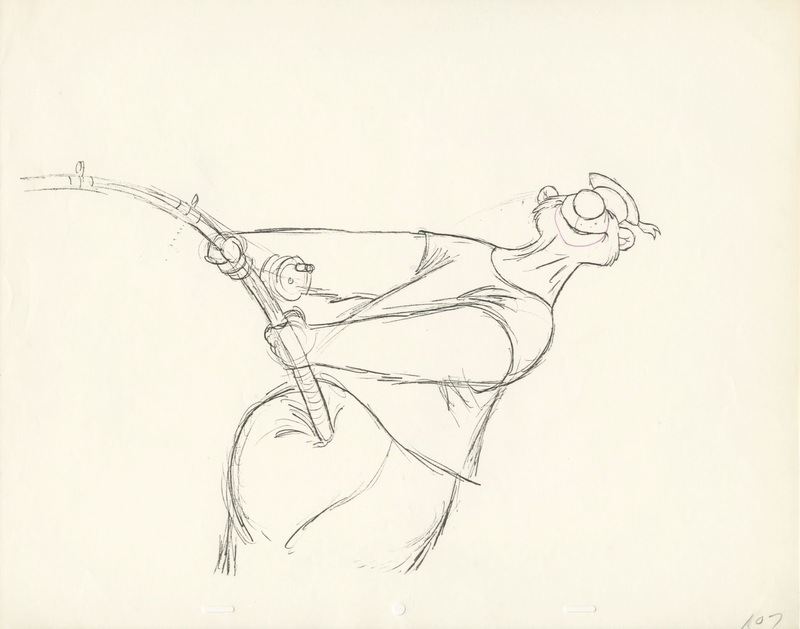 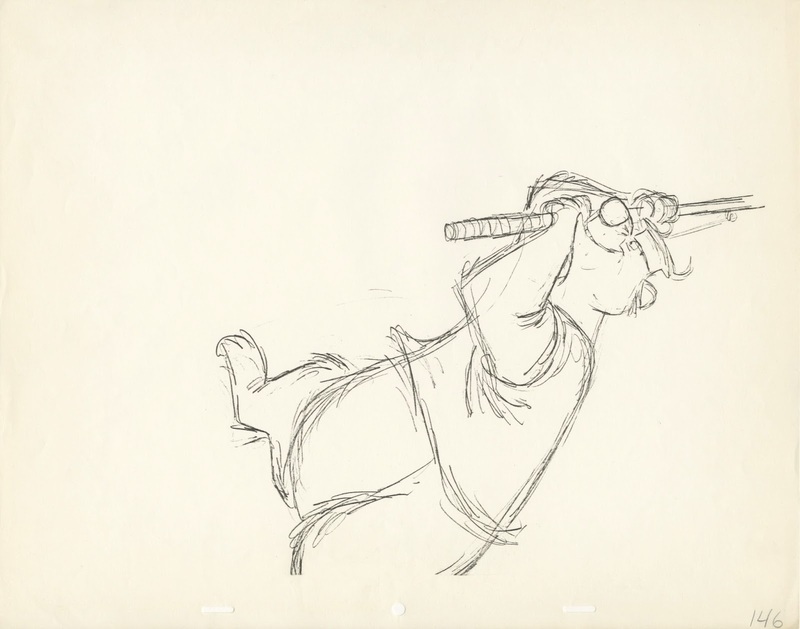 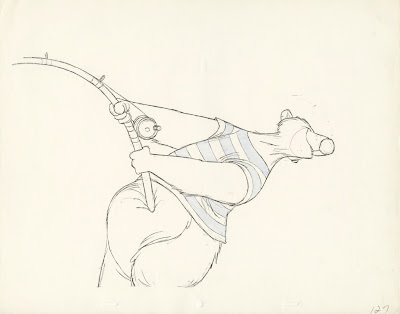 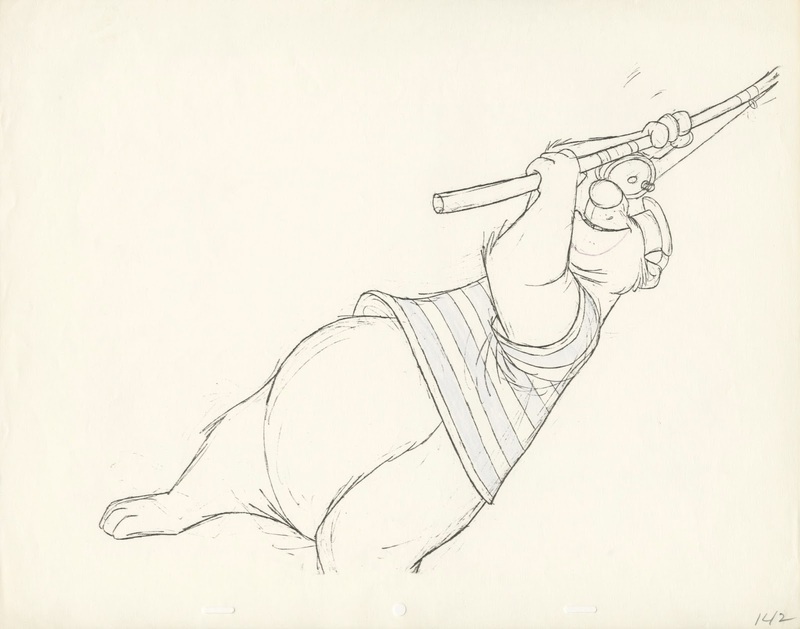 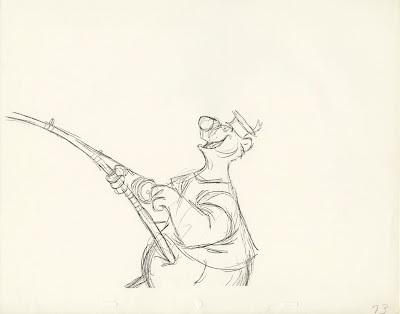 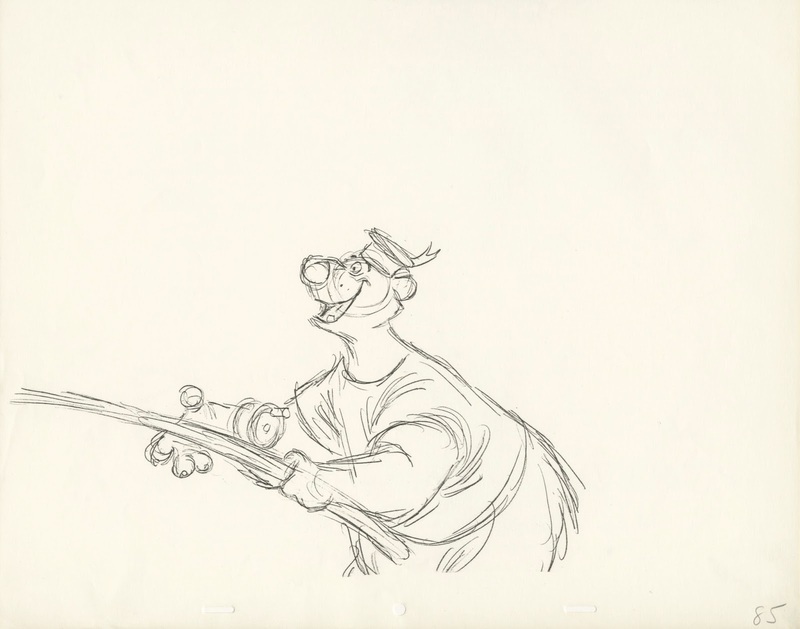 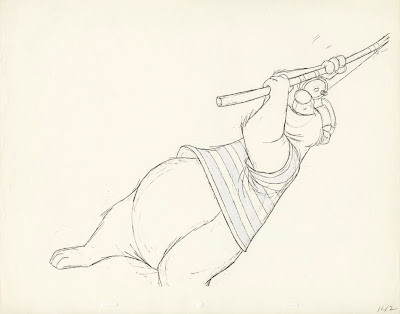 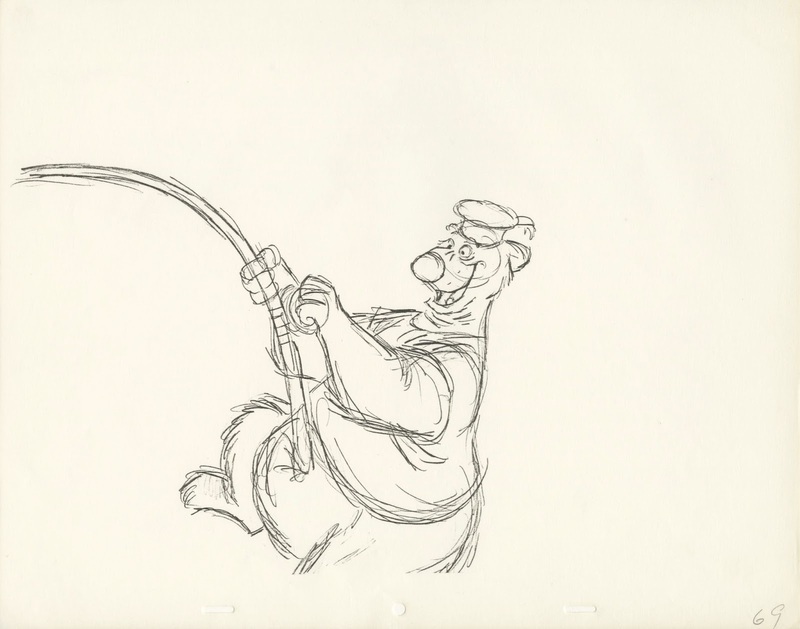 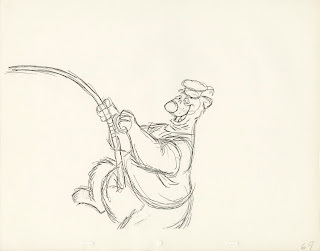 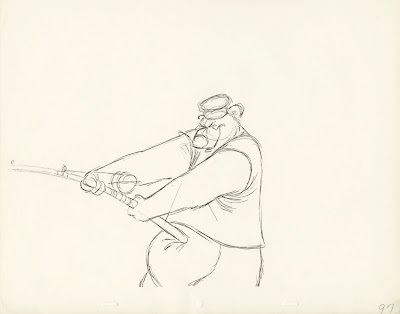 Milt Kahl dominated all final designs in those days, and that's a good thing. As Brad Bird said, without Milt's influence, the late Disney movies would look style-less. 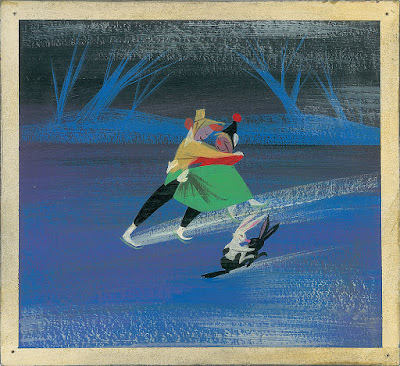 Without any particular graphic approach. 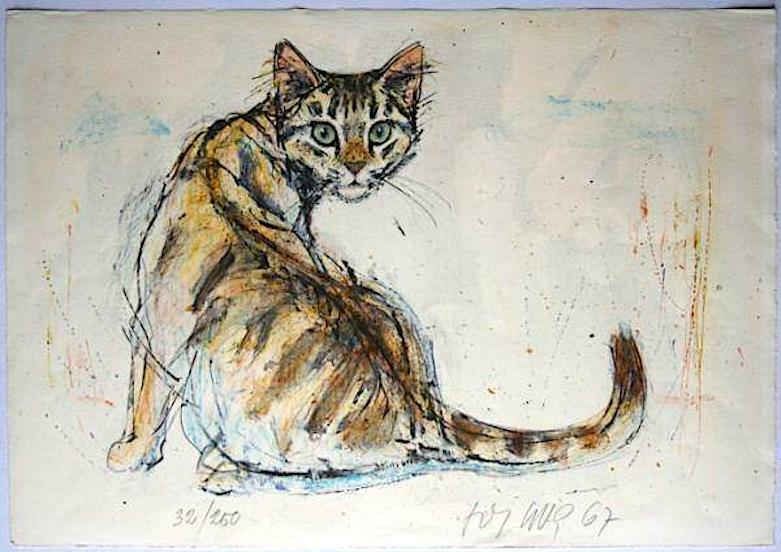 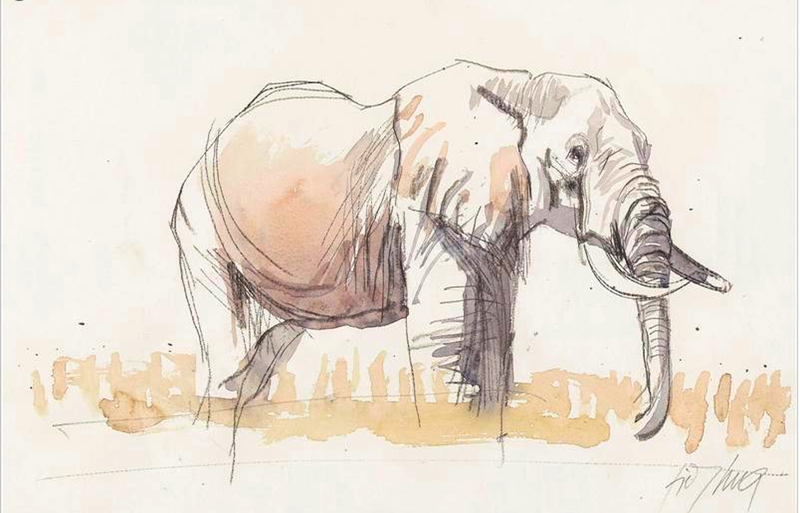 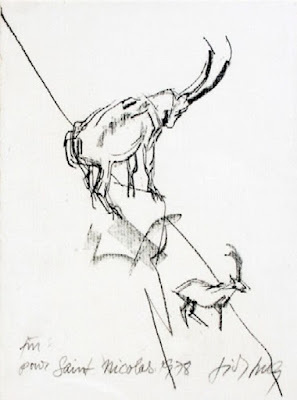 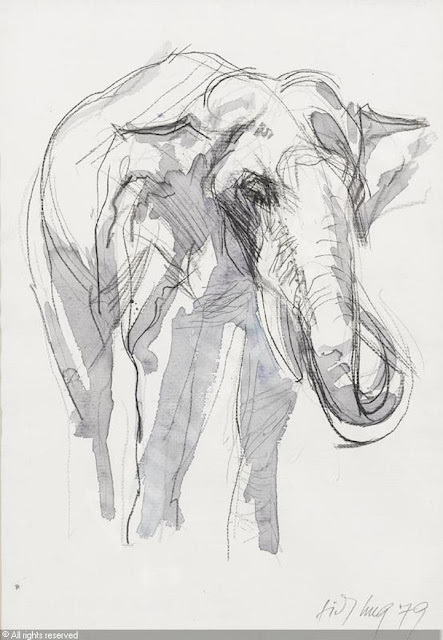 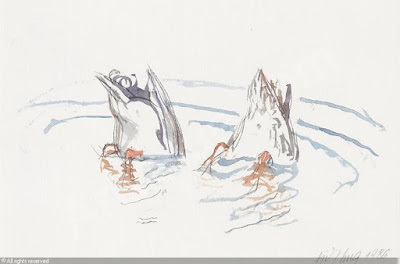 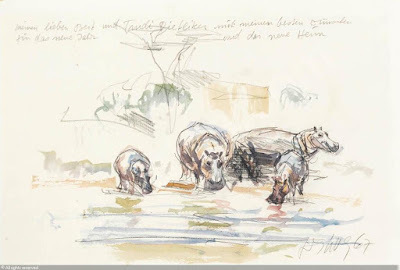 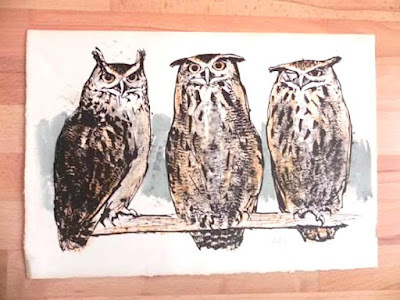 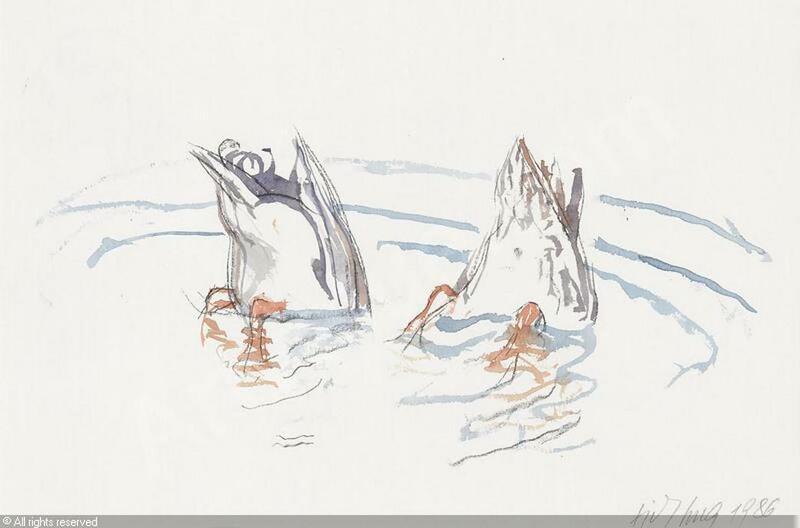 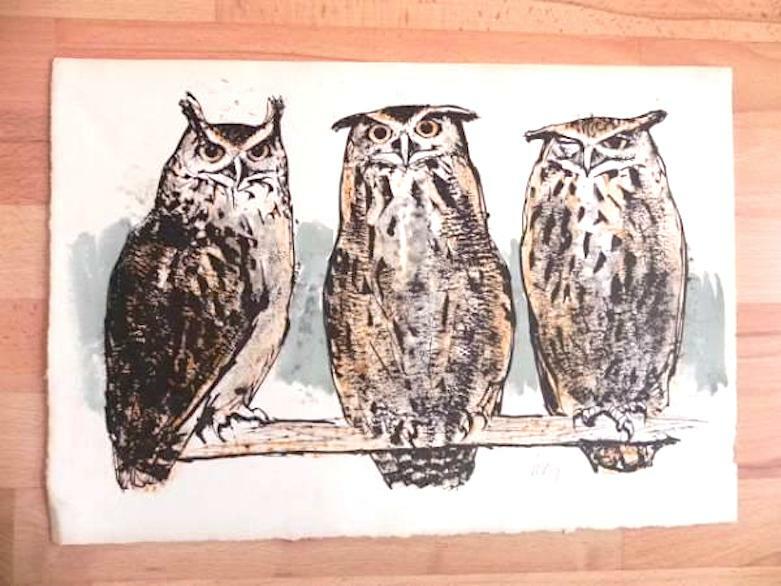 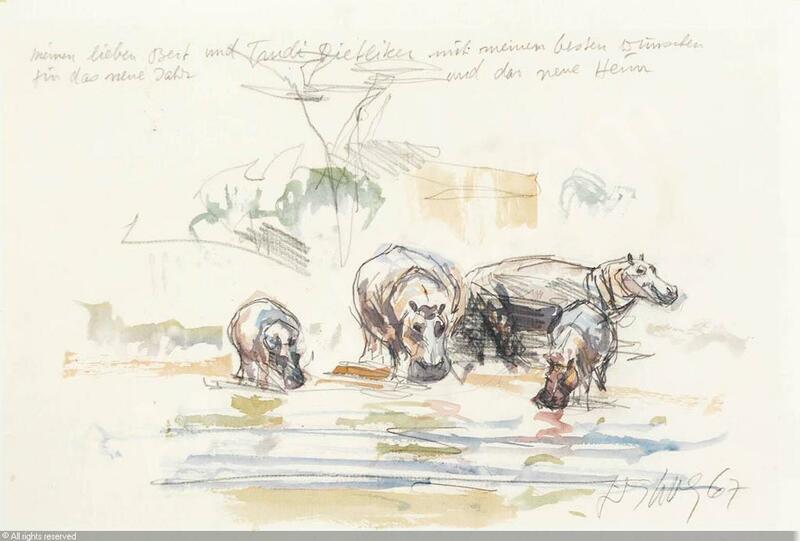 Discovering more of Swiss animal artist Fritz Hug's work is always a real treat! 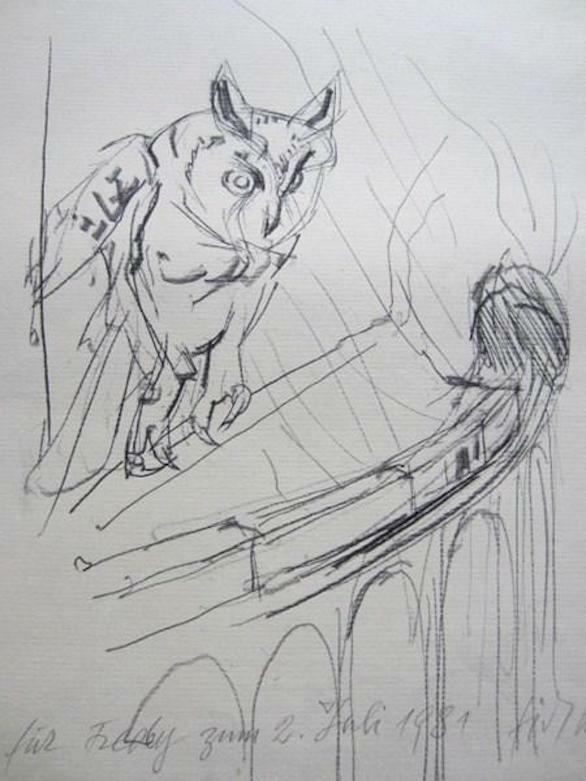 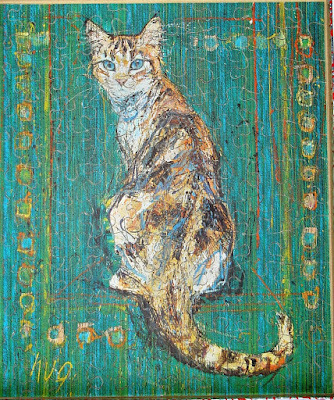 Here is another selection of his beautiful art. 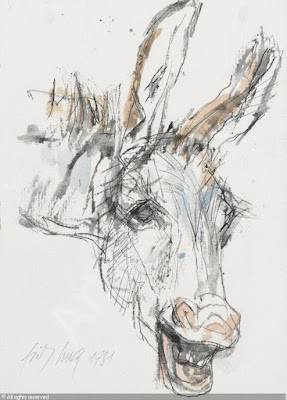 What intense observation, and love for animals. 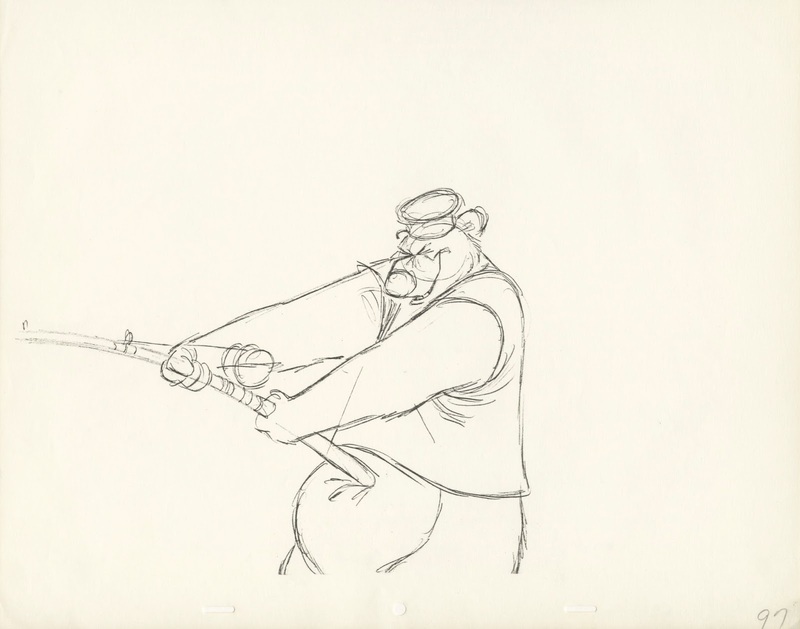 Here is the second half of Milt's scene from Bedknobs. 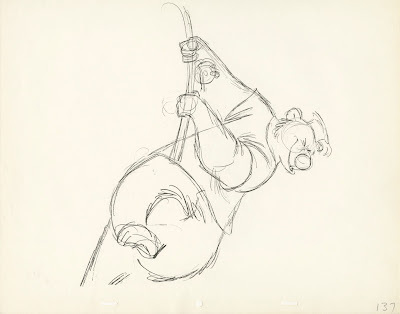 The Bear starts to bend forward in anticipation of the final big pull. 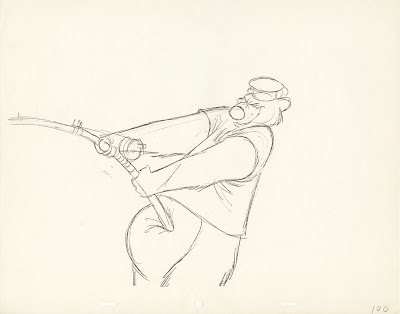 He tightens his grip on the fishing rod and pulls with all his might. 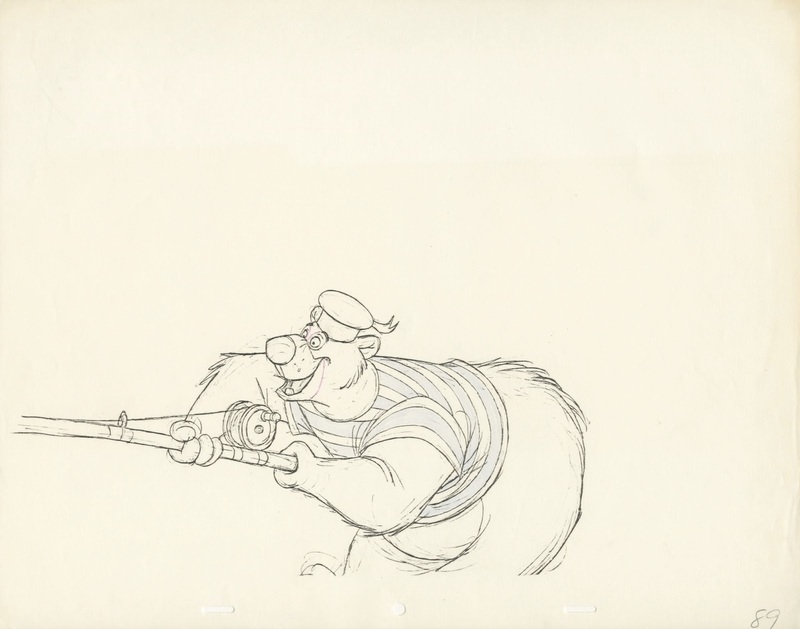 just when you think that drawing #107 is extreme, Milt turns the character's head on # 127 to maximize the effect of the Bear's exertion. 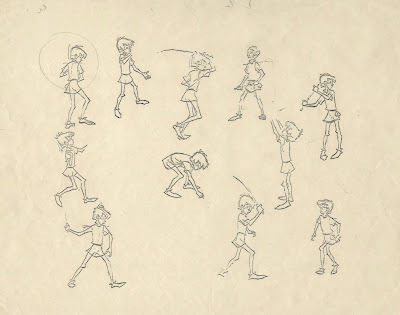 For those of you who are not animators, the final motion between #107 and #127 is what we call a stagger. 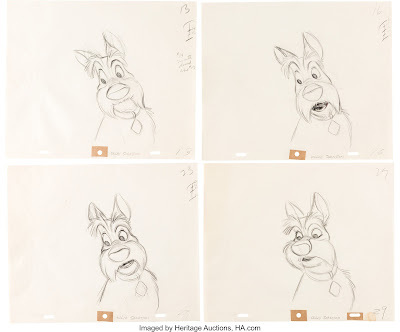 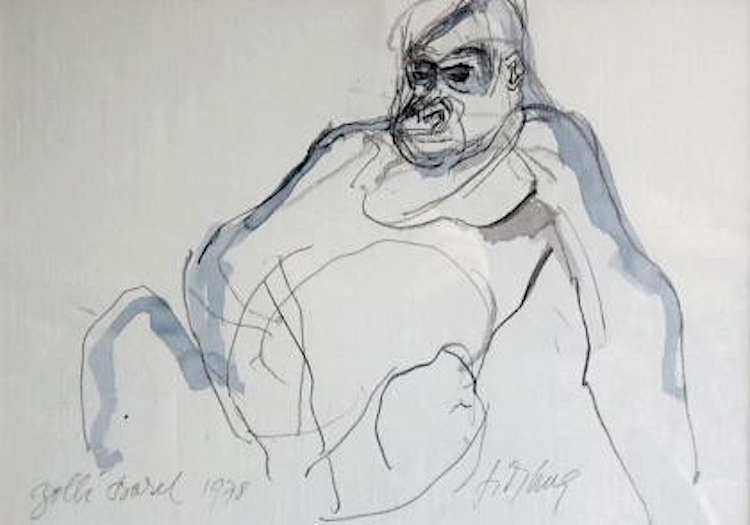 The animation here does not flow smoothly from one drawing to another, instead the "staggered in-betweens" move back and forth toward #127 in a subtle but erratic way. On the screen this reads as a moment of strong physical effort. 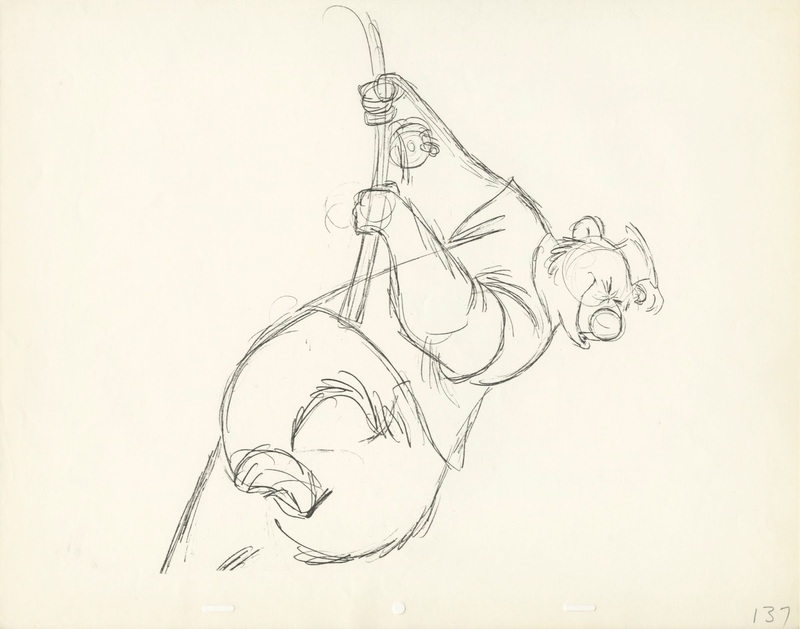 At the end of the scene after his catch (in this case five humans on a bed) is out of the water, the Bear stumbles backwards, as he tries to keep his balance. 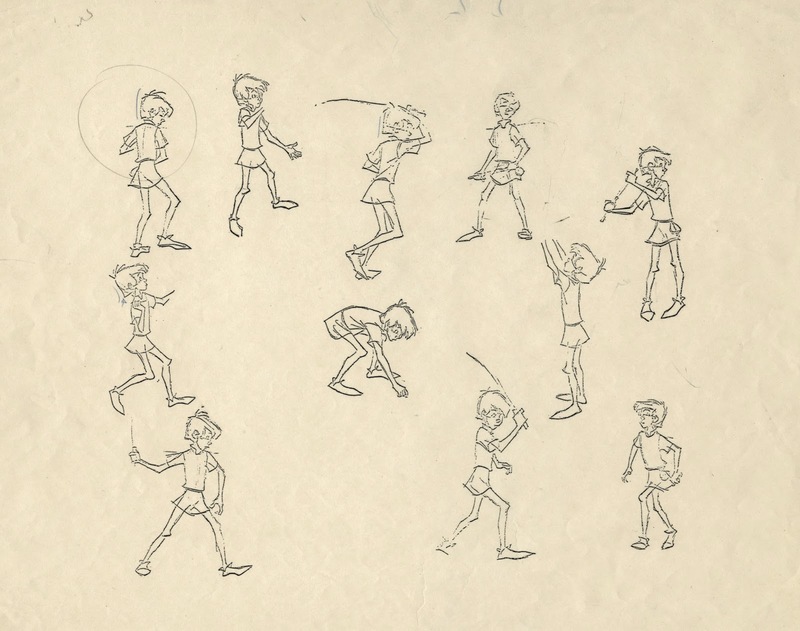 A text book piece of animation that is well worth studying.